ASTM A193 specification covers Alloy Steel and Stainless Steel bolting material for Pressure Vessels, Flanges and Fittings for High Temperature or High Pressure Service, or other special purpose applications. Several Grades are covered, including Ferritic Steels and Austenitic Stainless Steels designated B5, B8 and So forth. Selection will depend on design, service conditions, and mechanical properties, and high temperature characteristics. Material according to ASTM A193 B7 is often available in national coarse [UNC] thread pitches, if being used in traditional applications, threads are specified 8 thread per inch [TPI] for diameters above one inch. Below is a summary of a few of the common grades. ASTM A193, Grade B16 – a heat treated chromium – molybdenum – vanadium steel for high pressure, high temperature service. 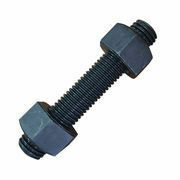 We “Reams Fasteners Private Limited” are a renowned manufacturer and exporter of an optimum quality Stud Bolt And Nut, Foundation Bolt And Nut, Hex Head Bolt And Nut, Shear Connector etc. Ever since our origin in the year 2015, we are a Private Limited Company and providing highly durable range of fasteners in diverse specifications. Located at Ahmedabad (Gujarat, India), we are instrumental in manufacturing the best class fasteners as per the industry set standards. Under the headship of our mentor “Mr. Jayesh Shah”, we have been able to accomplish emerging necessities and demands of our customers. We are export our products in Africa, UAE, UK, Sri Lanka, Egypt.